You know those big adjustable measuring cups that are supposed to make measuring goopy stuff like molasses or peanut butter easier? Now they have a little brother. Let me be perfectly honest. I had one of the original cups, and I really didn't like it. Moving the pusher to the right measurement was hit-and-miss and the pusher was just hard to push. And then when I took it apart for cleaning, it was a pain to get it back together. Besides being small, the mini adjustable measuring cup from OXO ($5.95) has solved the problems I had with that old adjustable cup. Instead of shoving the pusher up and down, this one is designed to twist, and it's a pretty smooth movement. It also comes apart and reassembles easily. There are two sets of markings, so you can level off the top for dry or really thick ingredients like peanut butter, and liquids measure slightly below the top, so there's less risk of spillage. Obviously you don't have to use this just for the sticky substances - it's just a little measuring cup. And I mean little. The capacity is 2 tablespoons in 1/4-tablespoon increments, and it also has ounce and milliliter markings. I sort of wish it had 1/3 tablespoon markings to measure teaspoons as well. But it doesn't. If you already have a kitchen full of measuring devices, this isn't going to be an essential addition to your kitchen. But for someone with a less-comprehensive setup, or who measures a lot of small amounts of goopy substances or who needs to measure 1/4 and 1/2 tablespoons a lot, this could come in handy. Since it's adjustable, it takes the place of other measures. 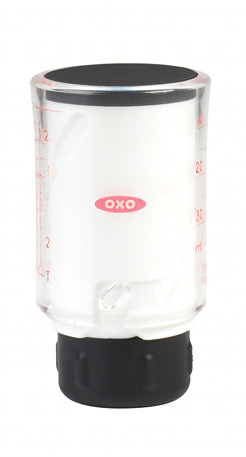 OXO also makes a 2-cup adjustable measure that has the same twisting function. I haven't tested it, but if it works the same way this little one does, it might be worth looking at, if you're in the market for a larger adjustable measuring cup. A sample was provided to Serious Eats for the purpose of a review. I found King's Hawaiian at Arby's!